Not easy to find , the Nilya is situated roughly 500 metres uphill from Ephesus Museum. We were actually the only guests staying but we were greeted with a hot drink and a welcoming chat by our host, and stunned by the beautiful decor and location with it's fabulous panoramic views from the garden and storks flying overhead. The breakfast is very good with choice of freshly cooked omelette or fried eggs. There is free of charge transport to Ephesus which allows 3 hours to visit the site before return transport. Nilya has a sister Hotel Bella 5 minutes walk away which offers great food in it's rooftop dining room . We stayed here for two nights and enjoyed very moment. We stayed in the suite and had a lovely balcony with company provided by a neighbours dog. The hotel provided us with a guide book for Ephesus and arranged a private tour which we thought was good value for money. Can recommend it highly!!! We stayed here for 3 nights. From the moment we arrived the hosts were very hospitable and friendly, offering warm drinks or suggesting things to do or giving directions. we were looking to check out the local attractions on our own rather than join a tour, so after breakfast the owner actually drove us to upper gate at Ephesus and picked us up a few hours later at the lower gate, it was perfect. He also helped us book a day trip to Pamukkale, which was also fantastic. The rooms are clean and beautifully decorated in an Ottoman style, with carved wood accents and painted tile. We really enjoyed eating the complimentary breakfast in the peaceful terrace every morning. Lastly the location is very good. We arrived and found our way from the bus depot quite easily, and when we left we walked to the train station in less than 10 minutes. Its in a quiet neighborhood among other houses and hotels but its a very short walk to the bars and restaurants area, or to some of the attractions like St Johns Basilica and Ephesus Museum. I knew when I walked into the charming courtyard of this hotel that my friends and I were in for a treat. 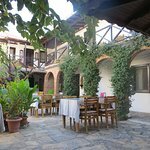 The entire time we were in Selcuk (to visit the nearby ruins of Ephesus, just a few minutes away), we felt like guests here at Nilya, not at all like clients. The rooms were very clean and comfortable and had a true, Turkish feel with the art, tapestries, etc. There are lots of nice, little corners to sit on couches on the common balconies and relax, or just have a cup of coffee in the gorgeous courtyard. The breakfast was also very nice - omelettes made to order, fruits, vegetables, delicious jams and honey, etc. The location was ideal. The hotel is on a quiet back road, but just a short walk down that road is a convenient little store to buy snacks or food supplies, and a few minutes (7-10 maximum) from the hotel is already the main road of Selcuk with lots of restaurants and shops. The kind owner of the hotel made sure we knew how to get around, and personally took us to Ephesus and the Temple of Artemis to make things more convenient for us. It was a really nice stay and I highly recommend Nilya Hotel.